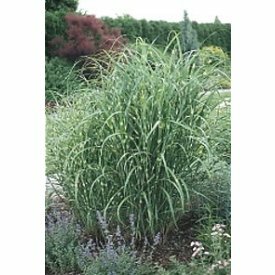 Features and Benefits An exotic looking warm season grass growing to a height of 4 to 7 feet. Spread 3 to 5 feet. Distinctive yellow and green banded grass blades. In late summer silvery white plumes appear. Prefers well drained soil. Very tolerant of heat and humidity. Dramatic as a mass planting or groupiing. Low maintenance eye-catching accent. Zone: 5-9 Height: 4-7 Feet Spread: 3-5 Feet 4-9 inches at time of shipping. Ships bare root items will arrive within 1-10 days from date the plant(s) are ordered.